Steven Wright appears Saturday, Jan. 13 at the Keswick Theatre in Glenside. Comedian Steven Wright remembers fondly the five years he spent as a producer on Louis C.K. 's "Louie." Very different from any of his work in stand-up comedy, TV or film, Wright compared the behind-the-scenes work to being a member of a band. "It was like [C.K.] was a band [leader] and he let me sit in as a member of his band," he said. Whether you remember his movie cameos – that time he lent his voice as DJ K-Billy in the famous torture scene in “Reservoir Dogs” – or the stoner “guy on the couch” in Dave Chappelle’s “Half Baked,” Wright has had a pretty successful career in both stand-up comedy, film and as an Oscar-winning film producer. Even during his earlier TV appearances on “The Tonight Show” and “Saturday Night Live,” Wright established himself early on as an obscure, laid-back humorist with an affinity for surreal, ironic one-liners and sometimes nonsensical jokes delivered in his trademark low-energy, deadpan, sleepy tone of voice and overall demeanor. “That’s just how I am,” Wright told PhillyVoice during a recent interview previewing a show at The Keswick Theatre on Saturday. His latest CD, "I Still Have a Pony," was nominated for a Grammy and his latest hour-long Comedy Central special, "When the Leaves Blow Away," is available on DVD. In 2009, Wright’s first CD, the 1985 Grammy-nominated album, "I Have a Pony," was re-packaged with a DVD of his first HBO special, "A Steven Wright Special" as a re-release, as part of Warner Bros. Records 50th anniversary celebration. Wright has also earned two Primetime Emmy Award nominations for his work (2010-2015) as a producer on the FX series, “Louie." Late last year, FX put the kibosh on the show after sexual assault allegations surfaced against C.K. They were brought by five women who claimed they were assaulted between the 1990s and 2005. Asked if his relationship with C.K. has changed since that news broke, Wright's answer was clear. “It hasn’t. He’s still my good friend,” he said. What Wright said he loved about producing “Louie” was that he was able to discuss aspects of the show that he never did with anyone else when he was calling his own shots in the role as a stand-up comedian. “It was just great to discuss the elements of the show – the script – going into the shooting and editing and having all these discussions with this brilliant comedian," he said. In addition to his stand-up work, Wright also plays guitar, and will incorporate the instrument in his act from time to time. “I play insane, crazy songs, but I don’t go in public and play a whole thing. I’ve never played serious songs in public,” he confessed. “I started out painting and drawing in elementary school. That was my first creative thing. I like to paint, write and fool around with the guitar. I like to make s**t up in different art forms. And as for what Keswick Theatre audience members can expect this weekend? 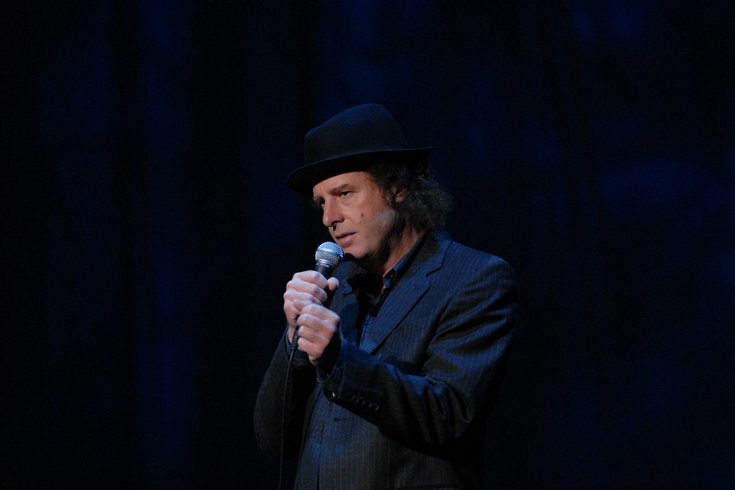 Steven Wright appears Saturday, Jan. 13 at the Keswick Theatre in Glenside. Show time is 8 p.m.